Game on. I’ve been told to meet the organisers outside the entrance to Fine Food Australia held in the new International Convention Centre in Darling Harbour. I take the light rail in, and it was surprisingly packed so I spent the whole commute completely on edge lest someone trip over my bag of brewing gear. I meet David Lyons, my colleague at AUSTCS and a WTBC judge (we are playing it safe and he is not in the cohort that will judge my round), at the meeting point and Tania soon joins us straight off a bus from Castle Hill where she is staying with family. We wait a while and soon MK appears, furnishes us with passes, and ushers us in to the prep area behind the main stage where we stash our gear. There’s no schedule, but we’re told Tania will be on before lunch and I will be on after lunch. 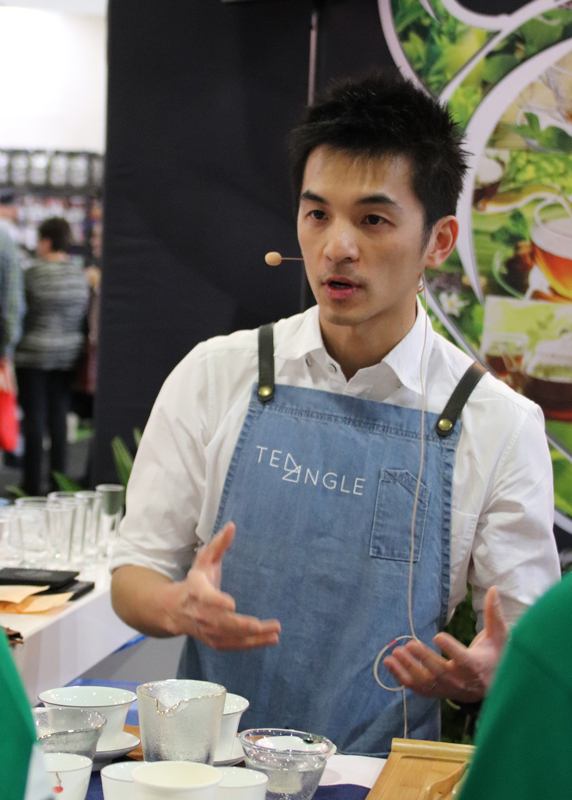 Apparently the order is random in the China competition but, to appease a few people, Sunny Huang and an associate of his at Tea Journal (Cecilia?) will be up in the first two slots and Matt Tran from Tea Angle has agreed to compete if he can come down in his lunch break. 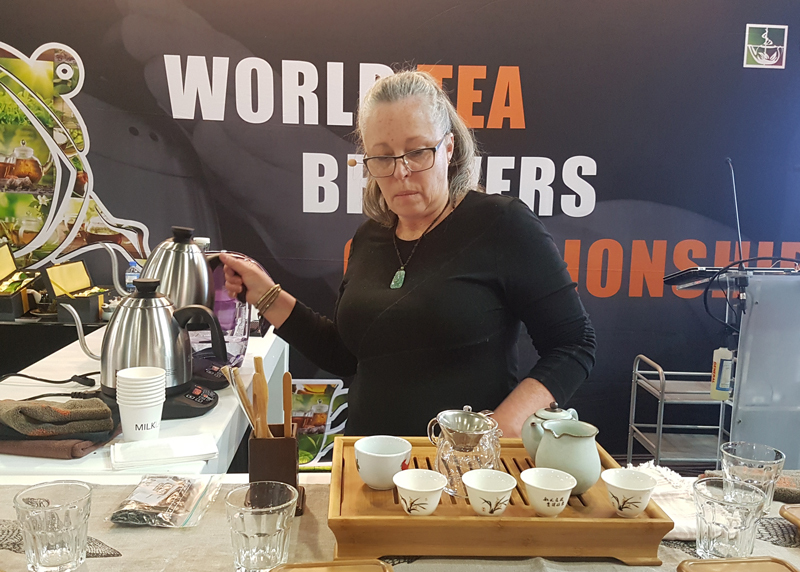 Tania and I go for a wander around the Fine Food stalls and meet the owner of Tuocha, who is impressed with us and gives us a free box of tea each. Fine Food is a trade show so maybe they give free boxes to everyone but it seems very generous. Basilur and some Sri Lankan tea people are also displaying their wares. First competitor is Sunny Huang of Tea Journal. WTBC organiser David Parnham is rather relaxed about the setup time, not counting it in the prep time, which blows my advantage in being able to set up in under 90 seconds. Tania and I watch Sunny, who serves three infusions of the mystery tea and reckons it’s a Huangshan maofeng. It feels wrong to be able to watch the presentation, as if going later means you can gather all the info you gleaned from the previous contestants for your own guess. Fast forward to the afternoon and it’s Tania’s go. We know by now it’s a green tea from how the other contestants have treated it and the guesses they’ve made but won’t get a closer look until we’re given it at the start of our prep time. I realise at that point that I’ve forgotten to bring my glass teapot, which is what I would have brewed a green tea in. Tania says I can borrow hers when she’s done, seeing as Matt is in between us. Except Matt is not in between us. He hasn’t showed and Parnham can’t get through to him on the phone so I get bumped up in the schedule and have to do without a glass vessel. I disappear into the back room to retrieve my gear just as Tania’s making a guess that it’s a Korean green tea. When I finally get a look at the leaves and test them in my gaiwans, I have to concur. The dry leaf is a grey-green colour, certainly pan-fried, which rules out Japanese green tea, but it doesn’t quite fit the profile of many Chinese greens I’ve tried either. The flavour is mostly vegetal with a hint of marine, which suggests to me it was grown near the sea. The wet leaf is bright green, very fresh, which suggests this year’s harvest. Of course I forget the mention this to the judges in me presentation. Later I remember some Vietnamese green tea a friend gave to me that had the same grey-green colouring and I wonder whether it is a result of volcanic growing conditions. My two gaiwan testing method reveals that at 60C for 30 seconds there is a pleasant taste and an extraordinary mouthfeel. At 80C it brings out a lot of flavour but also a lot of astringency. I brew it at 65C/30 seconds for the judges but my gaiwan is so small I don’t have any for myself to try so I have to trust in my process. I lament the lack of my favourite glass teapot. Meanwhile, not long after I wheeled out my gear, Matt showed up and set up in the second area. He’s had no prior knowledge of the contestants before him and completes the round with a confident brew. The last contestant is Mark Thirlwall, who is also the host of the event, a highly unorthodox move considering he’s seen the wet leaf as he interviewed all the contestants after their rounds, has asked specific questions about their methods and has even tasted some brewed tea. At the end of the day it’s Tania in the lead, followed by Matt, Mark and then me. MK comes over to remind us to show the judges the scales as we weigh the tea, apparently a mistake everyone made. For her trouble, Tania gets a portable espresso brewer, which I tell her would be good to experiment with brewing tea. I spend the evening perfecting my signature infusion and signature drink, brewing it, selecting the best infusion and then using the liquor for the blending segment to minimise complications. I’m not a great public speaker but I do like talking to people about stuff I’m interested in and so once the mic is on, I am on. I spend the whole period after my prep but before the judges come out spruiking my round and telling people I’m going to tell them everything I know about tea (abridged, obviously) in 15 minutes. I’ve gone with the purple sheng from Helsinki with the one drawback that I can’t read the wrapper because it’s in Finnish and I forget to mention the harvest period (I say 2015 but not what time of year). So the talky bit consists of me explaining the different ‘colours’ of tea and how they are related to processing but how purple tea is named after the colour of the leaf and can be processed in any of the standard ways. I have to explain a little about sexual mutation and anthrocyanins (… I will definitely need to blog about this) and then about the difference between sheng and shou pu’er. I brew 5g (showing the weight on the scale) in my gaiwan at 90C and serve the third infusion. I explain to them why I think the third infusion is the best (the first and second can be a bit harsh) and one of the judges asks whether he can try to second infusion. The rules don’t cover this scenario at all. I give him the second infusion but then it means I have to rinse his cup again and that all costs me time. That part of the round goes really well, though. I feel I’ve explained everything adequately and shown a lot of knowledge about the tea. Later, Cathy tells me the only thing I forgot to do (other than mention the time of harvest) was to present the wet leaf. My signature drink is a bit of a risk, but I explain as I go why I chose the ingredients I did and also pre-empt the flavour by saying it will be polarising. Wanna hear the recipe? Of course you do. It’s 150ml of purple sheng, fourth infusion + 1/8 teaspoon of vanilla essence + pinch of salmiakki (salty licorice) powder. The licorice note in the salmiakki heightens the sheng properties while the saltiness and the vanilla ground it. Finland really did a number on me, in case you’re wondering. I love Finland. Finland Finland Finland. Of course licorice is really polarising in and of itself without the saltiness so yes, a bit of a risk, but I’m not actually in it to win it so I though it’d be fun to present. Most of the judges leave dregs. Later I discover I set the kettle wrongly and it did not ‘keep warm’ at 90C so the fourth infusion was only at 78C or so. “Oh well, what the hell,” sang McWatt. In any case, it seems my presentation was so impressive that four or five intrigued audience members come up afterwards and ask to try the tea. I have to wash the judges’ cups in boiling water but I serve them a fifth infusion and it is still good and they, foodie people, coffee people, have become interested in tea. 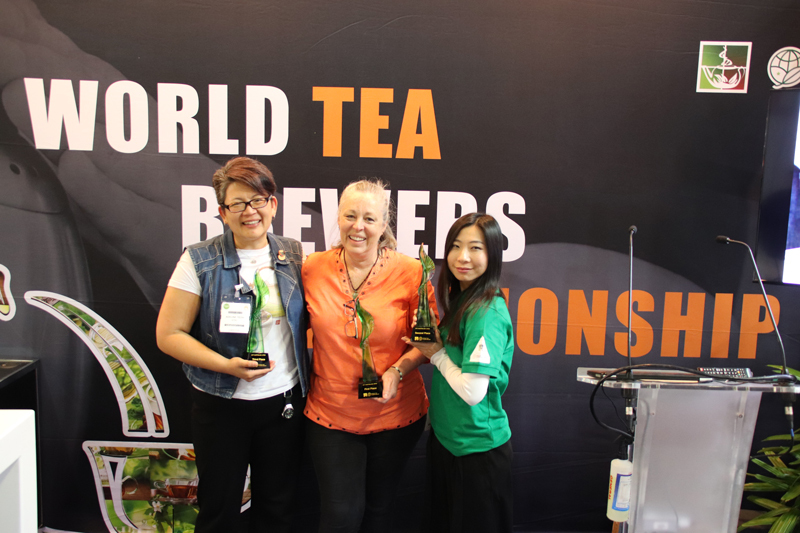 And this is why I do things like compete in brewing comps – not to win, but to expose tea to a wider audience. But it would be nice to win, eh? Tania and Matt both do a schmick job of their rounds, Tania showing none of the nerves that she had yesterday. The only issue was that her mic was not on as she did it, so a lot of what we can see and hear as audience members is limited. Matt has to go back to work after his round so he leaps ahead of me in the cleaning line and says his farewells. I wash all my tea gear and then Mark comes around and asks to borrow half of it for his round so I have to hang around until the end of the day… though I am curious about how everyone placed. There’s a ceremony of sorts and I’ve placed third! After Matt and the new champ – Tania! Ah, so Matt’s second again and he’ll be a bit annoyed at that but on the other hand that’s a pretty damn good placing for someone who did his rounds between busy periods in his day job. I get my wish, which is to take home prizes but not have to compete in Shanghai next year. My wonderful partner carries home the loot as Tania and I skedaddle off to see Raymond at MY Teahouse to wind down. In the following days Tania ends up being a great tea advocate and educator when talking to the media. She gets a lot of press, especially in her home patch of Melbourne, and even goes into some of the big radio stations to make her signature drink (Chinese yellow tea + Taiwanese red tea + a morello cherry in a sherry glass) and change the way people drink and think about tea. She takes on China next! Me? I put my trophy on display in my den. When people come to Salon de Teoh and say “what’s that?” I try to tell them all I know about tea in 15 minutes. This entry was posted in advice and tagged WTBC. Bookmark the permalink. Love this review, Adeline! Congratulations on coming third, and an even bigger congrats on giving tea the exposure it deserves. You’re an amazing advocate. Looking forward to admiring your prize in the Salon soon.